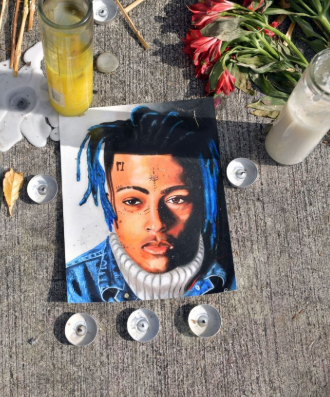 Florida rapper Jahseh Dwayne Ricardo Onfroy, popularly known as XXXTentacion was gunned down in a motorcycle dealership on June 18, 2018, and the police have finally decided to release the CCTV footage showing the rappers final moments. Upon careful investigation, and studying of CCTV surveillance footage, the police discovered that the attack was more strategic than they initially believed. The alleged suspects had stalked the rapper from the bank where he went to withdraw some money, all the way to RIVA sports, a store that deals in motorcycles and boats. The four assailants, Trayvon Newsome, Michael Boatwright, Robert Allen and Dedrick Williams, had stalked the rapper from their dodge SUV. As soon as the rapper got out his car and into the store, one of the assailants, Robert followed the rapper into the store to confirm he was the one. Minutes later, two others, Newsome and Boatwright went in to get the masks used for the robbery. As soon as the rapper got out the store and into his car, he was cut off by their SUV. Both Michael and Trayvon got out the SUV: masked and armed, they got around to the wrapper’s car and soon after there was a scuffle between the rapper and the one who is believed to be his killer – Boatwright – before he was shot in the neck. The burglars made away with the rapper’s Louis Vuitton bag, and about $50,000 in it. Witnesses quickly called the police but before help could arrive, the rapper was reported dead. Following the rapper’s death, a lot of false accusations were made, in respect to a $3,000 bounty put up by the Broward County sheriff’s office for anyone with helpful information. Dedrick was the first person to be found in connection to the murder, he was arrested two days after the murder on June 20. Robert Allen was arrested on 27 of the same month. Boatwright’s arrest followed on July 5 and he was later found to be the shooter. Following his court hearing, he was refused bail. And Newsome was the last one caught. On September 28, the police finally decided to make the CCTV surveillance footage public, first showing it in a court hearing for Robert Allen. The case is still ongoing but fans of the rapper have reached out to authorities to grant justice to the friends, fans and family of the late rapper.